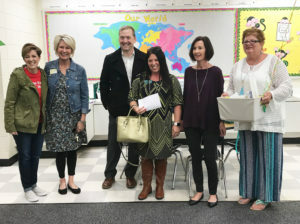 Cleveland Elementary teacher Petra Skipper has received the Super Star Teacher of the Month Award from the Greater Cleveland Chamber of Commerce. Pictured from left: Dori Franklin, Terri Sessoms, Mike Allen, Jennifer Williams, Super Star Teacher Petra Skipper, and Martha Stovall. The Greater Cleveland Chamber of Commerce has selected a Cleveland Elementary teacher as their Super Star teacher for the month of October. Ms. Petra Skipper was surprised in her classroom by chamber representatives who presented her with a prize basket. Super Star teachers are selected based on their excellence and leadership in their classroom, creativity and motivation of their students and for showing a high level of commitment to our community. Ms. Skipper is a lead teacher for her grade level and serves at Cleveland Elementary by volunteering to help with all events. Her students feel well cared for, comfortable, and therefore always do their personal best during class. Ms. Skippers likes to make her lessons personalized from her student’s learner profiles. Her encouragement motivates students both academically and socially. She is an inspiration to both students and coworkers. Ms. Skipper helps make Cleveland Elementary a great place for teaching and learning, according to her nomination. Congratulations Ms. Skipper and thank you for your service to our students and our community.